Isn’t this a powerful photo? Look closely. Here’s what’s going on. D1 college football player Koni Dole who plays linebacker for the Montana State Bobcats with one prosthetic leg is tying the shoe of one of his NubAbility football campers,who only has one hand, so they can get back in action. Older camper Calder, who plays QB without lower legs, pauses to patiently wait on his little friend to lace up. Koni is a VOLUNTEER coach at NubAbility Athletics All Sport Camp that serves Limb-different youth across the globe. Koni, like 60 other limb-different coaches (that’s right 60), serves for 5 days unselfishly at camp coaching and mentoring in 17 sports. Their objective? To get kids with limb-loss out of the stands, off the bench and into the game of mainstreamed school or league sport. They encourage courage and confidence through sport and in life. They pass it on. I don’t have to tell you the positive impact a confident child with a visible difference can have on everyone they come in contact with. I have the best unpaid job in the world! No, I have the BEST job in the world. I’m blessed to be able to do it uncompensated. I’m the director of NubAbility Athletics Foindation, a 501(c)3 Nonprofit charity that I co-founded with my son Samuel, who played college sports without an “extra hand”. We have grown rapidly the past 6 years. Only God can grow something so ferociously like we have. Nub: what many limb-different people call their limb-different limb. 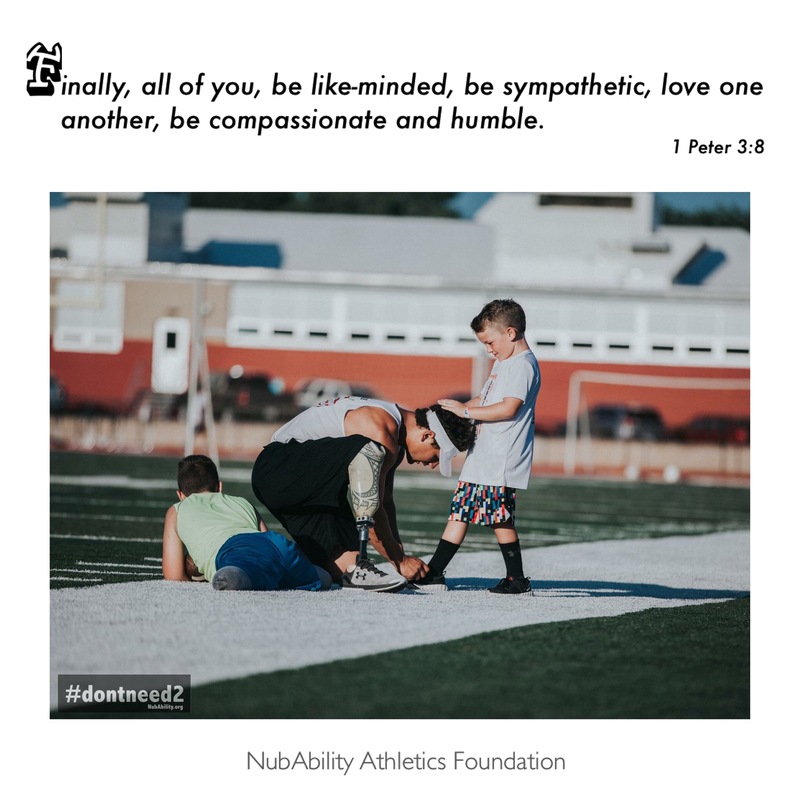 We hold camps across the country and we have a website, NubAbility.org that encourages limb-different youth and folks from all walks of life all over the world with stories, videos and coach bios. I would LOVE to come share my passion with you. Email me Jana@NubAbility.org for more info. May the grace and peace of our compassionate God be with you. Previous Post YAY YAY It’s MONDAY!